About 100 kilometres south of Brisbane in the Gold Coast Hinterland region of Queensland, Australia lies the beautiful Springbrook National Park, part of the UNESCO world heritage listed Gondwana Rainforest. The wilderness was formed by an ancient volcano which erupted over 23 million years ago and has evolved over time in to a nature lovers paradise. There are incredible hikes and walks, lush rainforest, majestic waterfalls, rare birds and plants, native wildlife, ancient trees and incredible lookouts to enjoy. There are plenty of walks and hikes for the casual day tripper or serious hiker. The Twin Falls Circuit takes approximately two hours to complete and is 4 kilometres return taking in the majestic dual waterfalls. For families or those with limited energy or time, the Natural Bridge walk is perfect, it takes about one hour to complete and swimming is possible at the base of one of the park’s waterfalls. The Purling Brook Falls track is another route that is ideal for the slightly more energetic and for instagrammers seeking the perfect photo opportunity, it is 4 kilometres return and is accessed by a suspension bridge which hangs over the creek and rainforest canopy. For serious hikers the Gold Coast Great Hinterland Walk is over 54 kilometres and takes three days to complete. Hikers will be rewarded with some of the most spectacular views, subtropical and temperate rainforest and ancient flora and fauna. While there is no bad time to visit Springbrook, the park provides an escape from the searing Australian heat in summer with the lush, cool rainforest and numerous swimming spots making it a refreshing day trip away from the Gold Coast’s famous beaches. 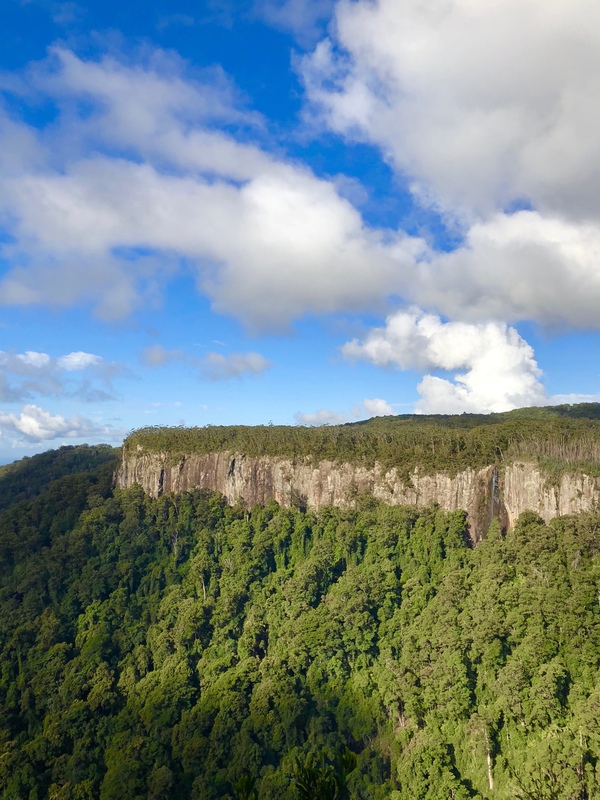 We would also suggest packing plenty of water and a picnic, there are vendors selling food and supplies at the Scenic Rim, however nothing beats a delicious homemade picnic overlooking the stunning valleys after a long hike through the rainforest. For a truly magical experience, visit Springbrook after sunset when you can witness the rare and beautiful bioluminescent glow worms illuminating the caves at Natural Bridge, truly one of nature’s most incredible experiences. For more information about Springbrook National Park visit here. We flew to Brisbane on Virgin Australia, for flights and information visit here. We’re going to Queensland next year, thanks for the information and gorgeous photos. It looks well worth a visit. Definitely visit if you get a chance, it’s a very beautiful part of Queensland.